WHERE HAVE PAST GIFTS BEEN USED? During fiscal years 2009-2014, over $10MM dollars has been given to Mars Hill Church by the Mars Hill global family. During that same time period $22.48MM has been spent on church planting in the US, India and Ethiopia. In 2009-11 over 80% of funds given by the Mars Hill global family went to Acts 29 church planting and funds were consistently spent in India for church planting in each of those years. In 2012- 2014 expenditures for church planting efforts in India and Ethiopia were increased with the preponderance of expenses related to church plants and replants in the U.S. I GAVE AND THOUGHT THAT MY MARS HILL GLOBAL GIFT WAS SOLELY USED FOR CHURCH PLANTING OUTSIDE OF THE UNITED STATES. WHAT DO I DO? If you gave previously and were intending that your gifts would be used solely for international efforts, we sincerely apologize for the confusion caused by a lack of clarity on our part. If you still want your previous gift(s) to be directed to our international work, please email giving@marshill.com and we will make sure that your previous gift(s) will be used to support making disciples and planting churches specifically in Ethiopia, where we are currently supporting 40 evangelists, or in India, where we support 33 church planters. From July 2014, we have clearly communicated that donations to Mars Hill Global go to making disciples and planting churches in the United States, Ethiopia, India and wherever else around the globe Jesus calls us into his mission. Let’s take the first question and answer. Mars Hill Global was first discussed in 2009 as a means of connecting with people who were not attending a Mars Hill Church. Eventually, it became a fund that supported Mars Hill church planting, Acts 29 Network of churches, and the Resurgence training center. However, in late 2011, that changed with the elevation of Sutton Turner as executive pastor. 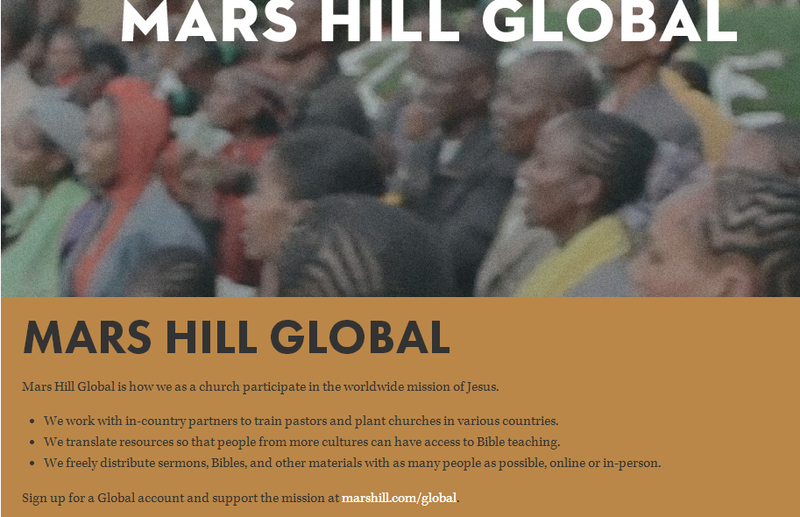 Gradually, the description of Mars Hill Global changed to make it into a way that Mars Hill Church could help international mission efforts. At times, the description was confusing in that Global sounded like both a source of donations (“the podcasters”) and a destination for assistance (Ethiopian evangelists and Indian church planters). By the FY 2013 annual report, the transition to Mars Hill Church’s way to “participate in the worldwide mission of Jesus” was complete. All accomplishments listed on this page were about Ethiopia and India with no mention of U.S. church planting, Resurgence, of Acts 29. If you gave previously and were intending that your gifts would be used solely for international efforts, we sincerely apologize for the confusion caused by a lack of clarity on our part. This statement vindicates my reporting on this subject and the petition on Change.org. Of course, people thought their gifts were going to efforts outside the United States. The church told the congregation that Global had changed and all of a sudden videos of Ethiopian evangelists were leading off nearly every service. We really don’t have to debate that anymore. In 2012- 2014 expenditures for church planting efforts in India and Ethiopia were increased with the preponderance of expenses related to church plants and replants in the U.S. Expenditures were increased over what? What does a preponderance of expenses mean? This is spin and an insult to the requests that members, former members, other donors and the public have made. However, one fact is established: the church spent most of the money given for international missions to domestic expansion. This FAQ statement doesn’t come close to satisfying the ECFA requirement. This failure to comply with ECFA guidelines again raise questions about Mars Hill Church’s accreditation. How long will ECFA give Mars Hill Church to correct the situation? It seems clear now that the executive elders know the numbers but won’t disclose them. I hope this will be the next addition to the FAQ page. Giver intent. The organization is obligated to use a gift as directed by the giver or, alternatively, to choose not to accept the donation. Once the giver has indicated the intent for which the gift was given and the organization has accepted the gift, it is the organization’s responsibility to fulfill that intent, whether or not the gift fulfillment is required by law. I know some donors who will probably take them up on this promise. Even this promise, as nice as it sounds, raises concerns. Since Mars Hill still has not engaged in full disclosure regarding the disbursement of funds, then how will any donor know that the church will honor this new promise? Since changes have come as the result of public pressure, what is to assure donors that any future promises will be kept? Only financial transparency as requested by the Mars Hill Walk in the Light petition can begin to repair the erosion of trust. For all posts on Mars Hill Global, click here.